The last time Peter Coyote went to the Oscars, he found himself on the wrong side of the velvet rope. Walking down the red carpet before the show, he stepped out of line to greet a friend, only to discover a phalanx of security guards standing between him and the aisle reserved for celebrities. Relegated to the walkway meant for mere mortals, Coyote felt as if he was, in his words, "heading for Schenectady." This year things will be different. Coyote will not only walk the red carpet, he'll also be an integral part of the show. As the inaugural "Voice of the Oscars," the veteran actor will introduce presenters and help host Billy Crystal to move the show along part of an effort by producers Richard and Lili Fini Zanuck to streamline the production. For Coyote, his first appearance on the Oscar telecast must be somewhat bittersweet. Despite a screen career spanning two decades that includes collaborations with directors like Polanski, Spielberg, and Almodovar, Coyote has never been asked to present an award. But he insists he harbors no rancor toward Hollywood. "I have tremendous admiration for the camaraderie and the convocation of talent required to make a movie, and the Oscars are a celebration of that talent and that community," he enthuses. "But then there's another part of me that finds the merchandising, the hyping, and the selling to be repulsive. Still, as an adult I know you don't have the show without the business, and all I can be responsible for is how I comport myself." Straddling both sides of the velvet rope has, in fact, been a hallmark of Coyote's career ever since the mid-'60s. when he joined the San Francisco Mime Troupe, a radical political street theater A vocal member of the Bay Area counter-culture community, Coyote went on to become chairman of the California Arts Council. He documented much of that period of his life in his critically praised 1998 memoir Sleeping Where I Fall. Sitting in a cafe in Mill Valley, the bucolic northern California community where he lives, the 58-year-old Coyote seems reconciled to the ebbs and flows of his iconoclastic career. "It's hard but fair, what's happened to me," the longtime Buddhist acknowledges with Zen understanding. "I've chosen to live up here, and I don't participate in Hollywood that much. As an actor, of course, it sometimes stings to see so many of my friends participating, and to feel so locked out of it, but my character is my fate and there's no sense railing against who I am. Sometimes I'll go up for a great role and I'll lose it and think, if I was just down there [in Hollywood], maybe things would be different." So isn't there perhaps a whiff of vindication in accepting the Zanucks' invitation to participate in this year's Oscars? No, he insists diplomatically. "I'm flattered that when the Zanucks said they wanted this to be a classy, smart, fast production that they immediately thought of me." They were obviously thinking of his voice, too, which may be more recognizable than his face. 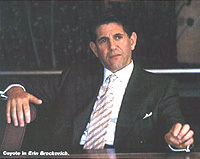 When not working in film (Erin Brockovich) or TV (Execution of Justice), Coyote supports himself doing voice-overs for products ranging from cars to Brita water filters, and he has narrated dozens of film and TV documentaries. "I can't take credit for my voice," he says modestly, "but I can take credit for helping to make difficult subjects comprehensible and for having an almost instinctive ability to capture the rhythm of a writer." That, he suggests, is one of the main reasons the Zanucks came to him for their live broadcast. Coyote, who proudly reports that he records books on tape without an advance read-through, is known for working accurately and efficiently under pressure. "If all they wanted was a voice, they could have gotten the guy who does the summer movie previews," he says, insisting that an audience of a billion doesn't give him the jitters. "But they wouldn't have known how fast or improvisatory or how perfectly he could do the work. What they wanted was someone who could play jazz."